ICON engineers performed an in-depth analysis of the new truck in stock form with a primary goal of identifying any limiting factors and weak points in OE components. Once this process was complete focus shifted to CAD development, in-house dyno testing, and real world ride tuning in an effort to address these issues while increasing wheel travel and overall shock damping ability. With the redesigned aluminum body featured on the 2015 F-150, ICON engineers spent a significant amount of time developing a new shock valving that addressed the “slimmer” truck’s ride characteristics. 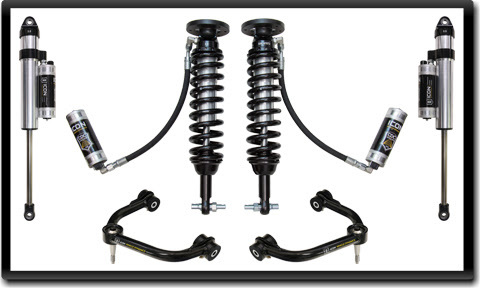 This research and development process yielded a collection of products including coilovers, rear shocks, and tubular steel upper control arms that have been organized into several staged systems that offer unique levels of performance for the new Ford. 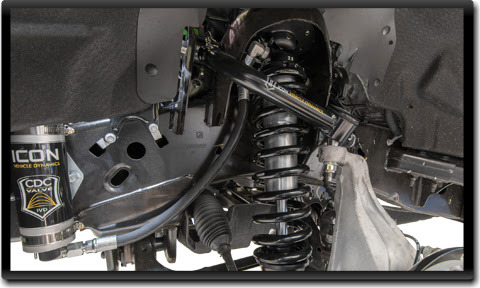 ICON’s 2015 F-150 suspension systems increase wheel travel by 12.5% over stock while drastically improving on and off-road ride quality. A remarkable level of performance is established with the Stage 1 system, which includes vehicle-specific tuned 2.5 Series coilover shocks and ICON 2.0 Aluminum Series monotube rear shocks that are both 100% rebuildable and revalvable. As the stages increase, the ability of the vehicle to handle exceptionally well in harsh off-road conditions is also increased with the addition of remote reservoir coilovers, 2.5 Series rear shocks, uniball upper control arms, and CDCV (Compression Damping Control Valve) technology. An adjustable coilover design offers up to 3” of lift height, allowing for the fitment of larger, more aggressive wheel and tire combinations. A 100% bolt-on design makes for a simplified and straightforward install while allowing for the ability for the vehicle to be returned to stock form if need be. ICON products are all proudly made in the USA at our Southern California-based facility by a dedicated team of off-road enthusiasts. 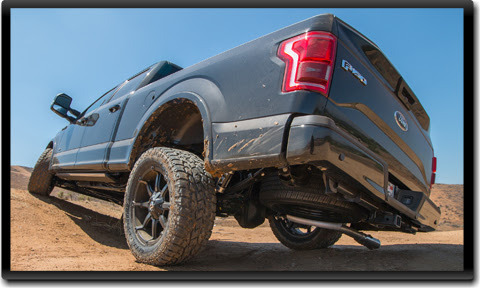 With our reputation for quality, performance, and service, it’s clear that ICON Vehicle Dynamics is the top choice for performance suspension systems and shock absorbers for 2015 Ford F-150 2WD pickups.